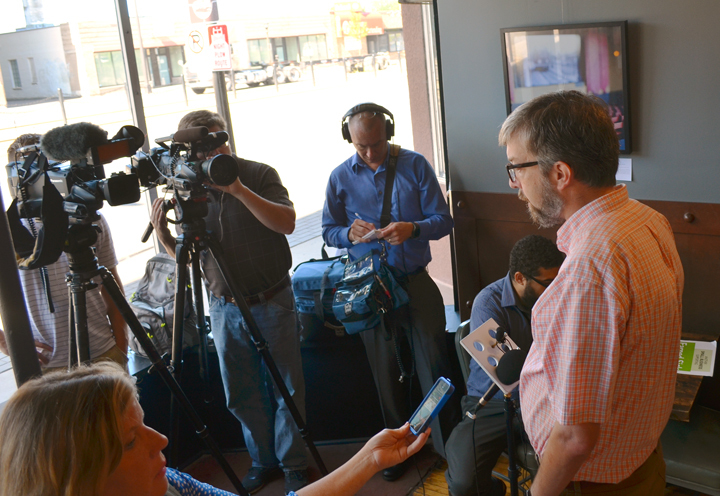 Ward 6 co-owner Eric Foster speaks at a press conference arranged by a coalition of businesses supporting St. Paul’s proposed sick-time ordinance. At a press conference today, small business owners in St. Paul said passing a citywide sick-time ordinance is the right thing to do – not only for the health of their workers, but also the health of their bottom lines. Providing employees with earned sick and safe time makes them less likely to jump ship for more stable benefits, according to members of the Main Street Alliance. The small-business coalition has signed up more than 40 St. Paul businesses that support the proposed ordinance, and several used the press conference at Workhorse Coffee to counter Chamber of Commerce claims that it would drive employers out of town. 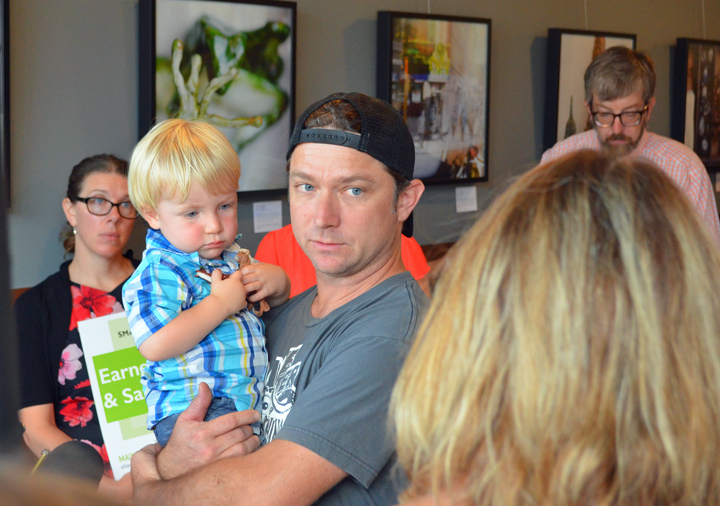 Lake Monster Brewing co-owner Matt Zanetti explains his support of a citywide sick-time ordinance while holding his son, Leo. “When we have to hire new people, we have to spend money and time to train them,” Bob Parker of Ward 6 restaurant added. Parker’s co-owner, Eric Foster, served on a task force appointed by the City Council to study the issue of earned sick and safe time. He took direct aim at the Chamber’s narrative. “Sometimes some groups have a tendency to say the sky is going to fall if we do this, and it never does,” Foster said. Raising minimum standards when it comes to workers’ health and safety, he added, would end the “race to the bottom” among employers competing to cut costs. The City Council is on track to take action on the issue Aug. 24. Both the task force and the city’s human rights commission have voted to recommend an ordinance requiring all employers to provide workers with one hour of sick time for every 30 hours they work, with sick-time earnings capped at 48 hours per year. If adopted, the proposed ordinance would extend benefits to an estimated 70,000 workers – and put St. Paul among about 25 cities nationwide with a sick-time rule on the books. Stark also reflected on his experience as a working parent of young children, being notified while at work that one had fallen ill. In addition to expressing support for the sick-time ordinance, Main Street Alliance also rolled out a “Shop Your Values” campaign for consumers looking to support St. Paul businesses that back earned sick and safe time. Find details, a map of participating locations and information about joining the alliance at www.tinyurl.com/SYV-STP.